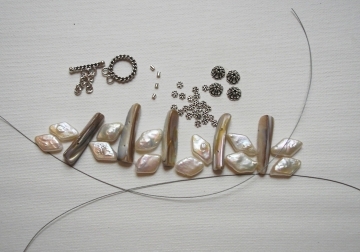 There are so many unique shapes and colors of freshwater pearl beads available for you to use in creating designs. 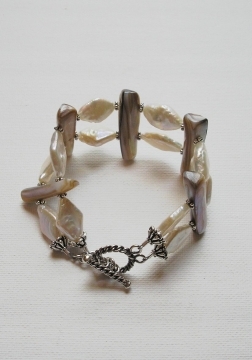 I found these nice white diamond shaped freshwater pearls, and decided to pair them with double-hole shell beads to create this great double strand pearl and shell bracelet. This pearly design is a great choice for summer. One strands of freshwater pearls. I used diamond shape pearls but any pearls will work. Five or six double hole beads or spacer bars. 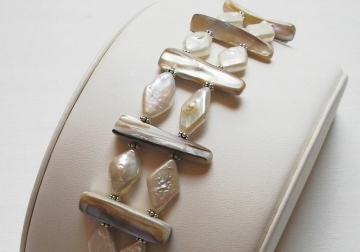 I used shell beads in this design, but you can substitute any bead or finding with two holes. Appx. 20 Bali daisy spacer beads (or other decorative spacer beads). Actual quantity will depend on your design. Decide how long your bracelet will be, and determine the placement of the beads and spacers in your design. You can use a bead board or ruler to check the length, and don't forget to allow room for the clasp. Tie a knot on one end of the wire, or place some tape over the end, and string all of your beads onto the wire. Check the length and overall design and make adjustments by adding, removing, or re-positioning beads until you are happy with the look of the bracelet. End with bead caps on either end for a decorative touch. That's it! 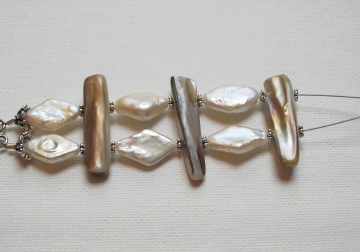 Your gorgeous new Pearl and Shell Bracelet is ready to wear or give as a great gift!